The Compleat Angler and Angler Adventures present “An Evening with Eve Reilly”. Eve has been the manager of the legendary Poronui Ranch for 18 years. Poronui, remotely located in the central part of the North Island of New Zealand, was recently voted by Forbes Magazine as one of the top 10 fly fishing destinations in the world, with a team of professional guides and convenient access to many of New Zealand’s best quality fishing waters. Join Eve Reilly and Judy Hall for presentation and hear Eve’s masterful stories of the wily brown and rainbow trout fishing in the North Island (the ones that got away and the ones that didn’t). Judy and Eve are both keen fly fishers and outdoor enthusiasts. Please join us Monday, June 27th, 2011 at the Compleat Angler’s new location, 537 Post Road, Darien, CT, 7:00 PM. We will have some nice raffle prizes, as well as offering anyone at the presentation who books a minimum 4-night/3-day fishing package November 1st – December 15th, 2011 at Poronui will get a FREE helicopter fly out during their stay! For friends of Poronui and Angler Adventures, this is a great opportunity to catch up, talk fishing, and maybe win a raffle prize. Call or email The Compleat Angler or Angler Adventures to reserve a spot, seating is limited. For those among us who love swinging flies in rivers for big salmonids, it can be a long winter! But you can swing to your heart’s content all winter long on the world’s greatest sea trout river! 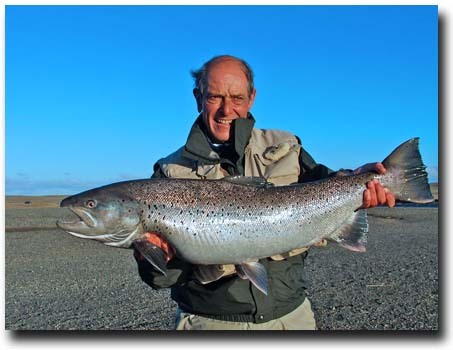 The Rio Grande in southern Argentina produces sea run brownies that average 12 pounds and frequently top the 20-pound mark! The original – the classic: Kau Tapen, the first lodge built on the Rio Grande, fishes 12 rods on 10 miles of the Rio Grande and an additional 15 miles on Rio Menendez. The normal rate at Kau Tapen is $7,250 p.p. from your arrival in Rio Grande City. International airfare to Buenos Aries, city transfer, hotels and in-country airfare to Rio Grande can cost another $2,200 – $2,500. However, Kau Tapen is offering a great “Hassle Free” inclusive package during selected weeks amounting to a savings of nearly $2,000 per person: 2011 Dates: Jan 8 – 15, Mar 19 -26 or Mar 26 – Apr 2. Rate: USD $8,105 per person (or just $6,796 not including international airfare). Kau Tapen’s sister lodge, Villa Maria is situated just downstream from Kau Tapen, near the tide head, and is the choice location to intercept the freshest, brightest sea trout. Normally weeks are $6,750 per person from Rio Grande City, but Villa Maria is also offering a domestic air-inclusive package for the week of March 25 – April 1, 2011, $6,550 per person; a savings about $1,000. This would include all of the above except international airfare to Buenos Aires. Aurelia is the next estancia upstream from Kau Tapen’s water and offers 6 miles of double bank fishing on the Rio Grande, and 15 miles on the Rio Menedez, Aurelia’s upstream location makes it most desirable during the second half of the season when their pools are literally stuffed with fish! Good space is still available for late February and March weeks. Rates from arrival in Rio Grande range from $3,580 – $4,680 per person until March 6th. The rate is $5,890 per person from March 6th – April 17th. Hope that you are all doing great there in Connecticut. A small report on what is going on at the Estancia, to wet your appetite. Last week the fishing at the ranch was outstanding to say the least. 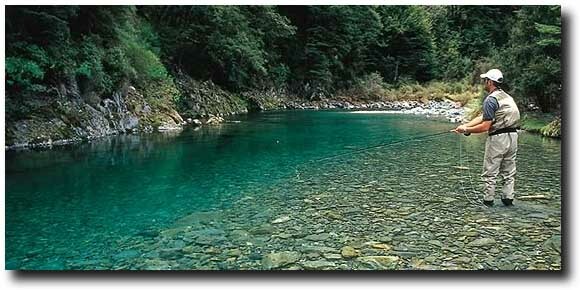 Our guests caught very nice trout on the Pedregoso Creek, the Coyhaique River and of Course on the Zorro Spring Creek. 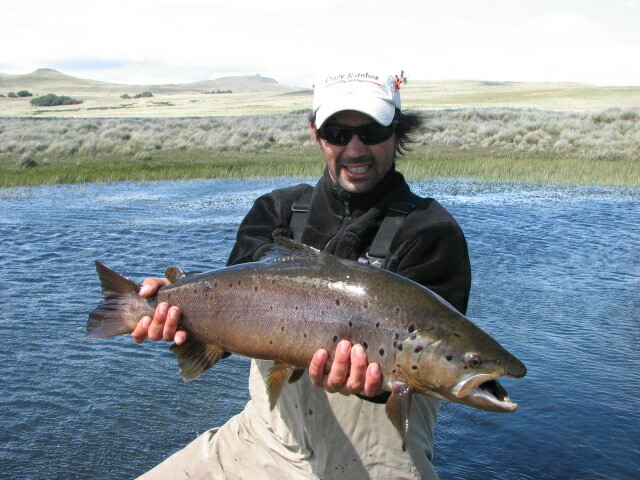 The Pedregoso was particularly productive there we have been averaging 50 trout per guest a day (between 12 and 19 inches). At the Zorro Creek they caught an overage of 15 trout per day, they were from 16 to 24 inches. (all in dry flies, since they did not want to use nymphs). We are starting to see some pretty good hatches in the afternoon (may flies and caddis); we expect that the fishing in the next weeks will keep getting better and better. Now we have a group from New York and Pennsylvania, they are here for the second time and were having a blast in the Pedregoso today. For more information, call (800-628-1447 / 860-434-9624) or email Chip Bates (chip@angleradventures.com) at Angler Adventures.